He stayed by my side the entire night, and after the yoga session, he nestled into my neck. I fell in love, despite having no desire to adopt another cat, especially a kitten. 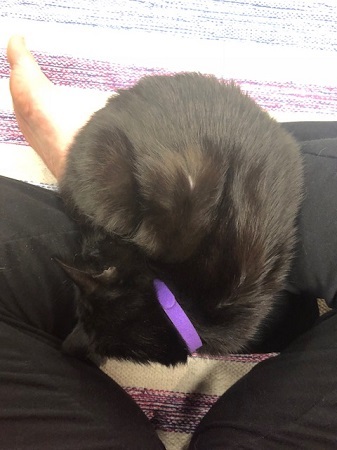 I went back to the cat cafe on Wednesday to get adoption paperwork, then brought Jason to meet him on Thursday. 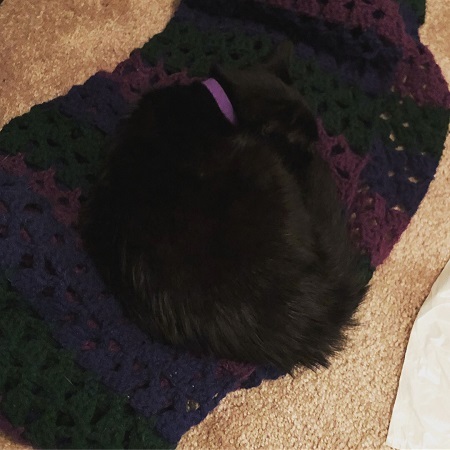 That’s when I found out that Jojo – then named Shadow – kinda curled up with everyone. In fact, he was bony and kinda lethargic and very cold. Since he was a stray originally, we figured he was just underweight. I fed him while holding him and he ate greedily, and I had the worried feeling that he was avoiding the food bowls in the cattery because there were so many other people and cats around. We were chosen to adopt him, and scheduled to pick him up on Saturday afternoon. When we arrived, however, the owner of the cafe said she had some concerns. Jojo had been losing weight steadily since they brought him in a few weeks earlier, and he had a persistent cough that sounded like he was trying to get up a hairball. The latter didn’t worry me as much since he’s medium-haired, but the weight loss was definitely worrisome. The owner was concerned that he might have a disease called FIP, which is 1) incurable, 2) fatal, and 3) easily spreadable to other cats. 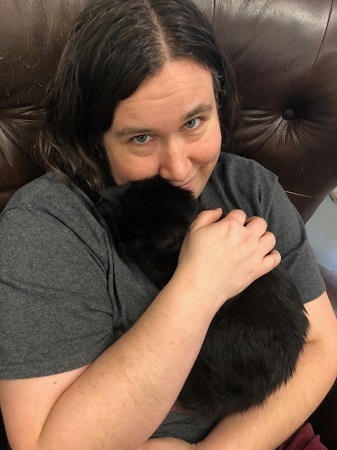 Which meant that if we brought him home, he might infect our other three cats with an incurable, fatal disease, and he might die in the next few weeks anyway. Now, FIP is a rare disease – around 1% – and the only way to diagnose it is to rule out all other options. That’s expensive and uncertain, and I personally had a strong feeling that Jojo’s background as a stray (who seems terrified of people standing over him or holding objects, indicating he met with some Bad Things in his short life) made him particularly susceptible to stress. Jason and I talked, and we decided to spend a few weeks fostering the kitty. We would keep him to our walk-in closet, with a separate food and litter area from our other cats, and wash up really well when we go between our room and the rest of the house. That way, if he does have FIP, he won’t infect our cats, nor will he infect the other cats at the cafe. We can also monitor his weight closely (currently weighing him twice a day) and watch his litter for signs of other problems (like tapeworm). As soon as we got Jojo home, he began to come out of that lethargic, shivering, curled-up state. He began to play for the first time. He jumped around to different shelves in the closet, began purring loudly, explored the rest of the bedroom. He immediately started eating and drinking and using the litter box, so the problem is definitely not one with swallowing or something. He had some intestinal upset in the beginning as well, but nothing to indicate tapeworm that we could see. Otherwise, Jojo was immediately friendly toward everyone, though scared whenever someone stood over him or carried something above his head, and he bonded with me immediately. I think he recognizes my scent, because he perks up and runs to me whenever I enter the room. We took him to the vet on Monday morning, just in case. He had no fever, and his heart and lungs sound fine, and there are no signs of parasites in his stool sample. But the diarrhea is worrisome, and the vet mentioned FIP before we brought it up. She also said it’s possible that the constant change in food might have been upsetting his digestive system, so if we keep his food consistent, he might improve. We’ll see. 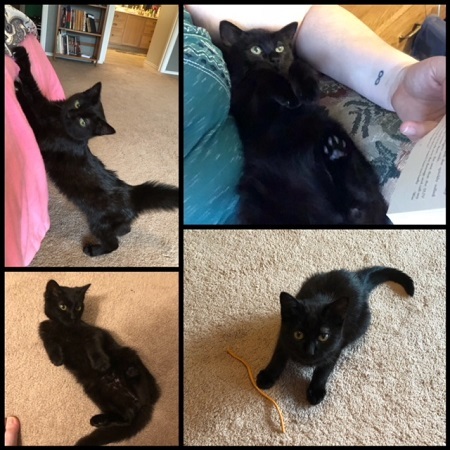 There are a few hopeful signs, like the fact that he can jump much higher than he used to and he’s begun that kind of restless constant play common in kittens. I really hope these next few weeks at home with us make all the difference to his health! Poor Jojo! I hope he eventually gets a clean bill of health, but should the worst happen you have given him such a better life than he ever would have gotten elsewhere. The improvements are definitely encouraging though! The good news is that he’s definitely gained a little weight now. Still, we have to take him back to the vet tomorrow for a couple issues. Fingers crossed that they’ll figure out what’s wrong this time! Jojo is soooo sweet! Congrats on adding him to your family. Crossing my fingers it’s not FIP and that his health will improve. I’m about 95% sure it’s not FIP by now since he’s gaining weight and has no fever. But he still needs to get healthy, which he’s definitely not. We need to figure out what’s wrong! He has a really awesome shot thanks to you guys. That’s really awesome and I’m so proud of you. I really hope so. I’m glad this is something we were capable of doing! I think it’s shows a lot of heart! Hey Amanda! Long time, no talk. Trisha – formerly of eclectic/eccentric – here. I think it’s really awesome that you guys went out on a limb for this cat. Not too many people would have. If you are interested in reconnecting, I am starting over in the blogging world at https://unfinishedintellectual.com/ Hope to see you there.